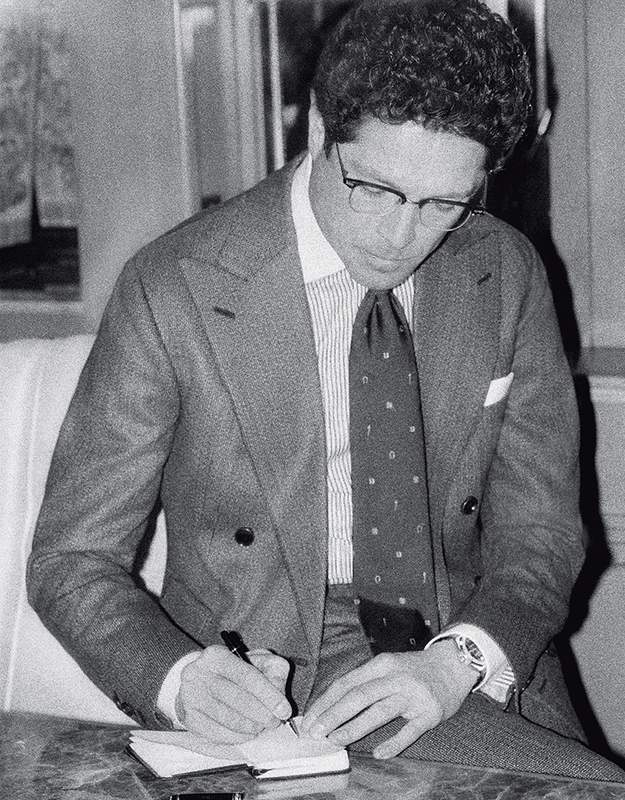 “I was raised in the middle of kilometers of fabric,” says Matteo Marzotto. “Thousands and thousands of kilometers of fabric.” He’s not exaggerating. Marzotto, forty-eight, is the scion of an Italian wool dynasty that stretches back to a single factory, built in 1836. Today, his family still mills wool — some of the world's finest, in fact — but the Marzotto Group has evolved beyond textiles. It’s a financial juggernaut, with Marzotto at the helm. His fashion adventures began in 2002, when Marzotto Group purchased Valentino. In 2005, he sold it for hundreds of millions more euros more than he had paid, which is always a good thing. Marzotto then revived the dormant French brand Vionnet — his Lazarus play — spinning it off to Kazakh billionaire Goga Ashkenazi for a princely sum he’s never disclosed. “I’ve been extremely lucky to find myself in the right place at the right time,” he says, with typical understatement. More recently, he’s been named chairman of Fiera di Vicenza, which hosts one of the world’s top gold and jewelry fairs, garnering attention for Italian craftsmanship and nurturing young designers. Like a good modern tycoon, he also gives back, raising millions for the fight against cystic fibrosis, the terrible disease that took his sister from him. But it’s the soft yellow metal that’s brought him to New York on this blustery day. Fiera di Vicenza is being recognized by the United Nation for its corporate responsibility and efforts to clean up the gold industry. In his suite back at the Michelangelo Hotel, Marzotto seems proud but unfazed. He’s wearing one of his trademark double-breasted numbers: “I love the double breast, but it needs to be very soft, almost no shoulder,” he says. It’s Marzotto wool, of course. His shoes were made by a master cobbler who has since licensed his name to a larger corporation. He used to make shoes for Marzotto’s father and uncles, too. (“These,” he says, putting one foot forward, “are from before”). His silk knit tie is nestled in the crisp white collar of his red-striped shirt. His look is bold, but not loud. Red is his other sartorial trademark. He’s literally commissioned his own shade. It’s on his bike, his motorcycle, his Ferrari, and his yacht. But it was for his helicopter, an AS350 B3e — his pride and joy — that Marzotto had it made. 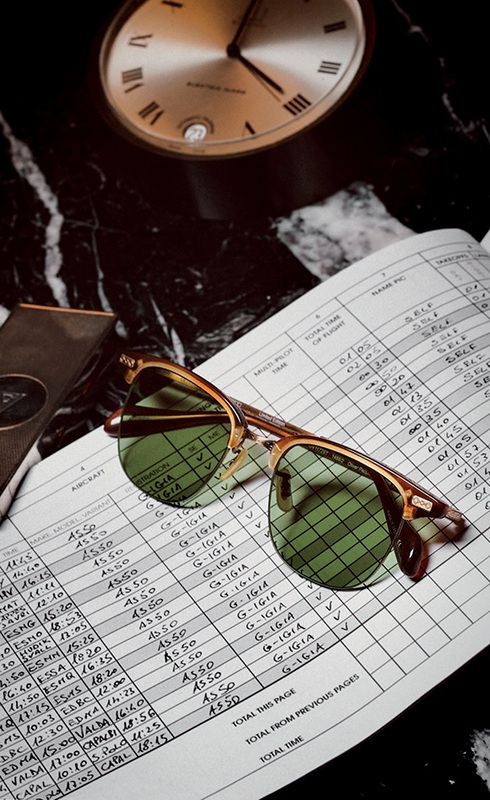 Executive I sunglasses in matte sycamore acetate with green-tinted lenses, antique gold ultra-thin titanium eye wire, and filigree detailing OLIVER PEOPLES vintage desk clock available at manoftheworld.com. Helicopter pilot logbook Marzotto’s own.